This is a little story of one of the first Social Directors to work the Catskills. Perhaps someone has heard of him. Somewhere some of you may have seen him. Once in a while someone remembers him. But a reference to the Bronx and the Catskills should make mention of him. He was my Dad's first cousin. Julie served in the US Army from Mar. 19, 1942 to Oct. 30, 1945--Staff Sgt. Decorations and Citations: Good Conduct Medal, European, African, Middle Eastern Campaign Medal, Asiatic Pacific Campaign Medal, Philippine Liberation Medal with one Bronze Star. Reason for Separation: Demobilization. Honorable Discharge. Julie played the role of Ollie Twardofsky in the movie version of Irving Berlin's Army play, "This Is The Army," but he was applauded for his "take-off" of Gypsy Rose Lee in the play when it was first presented on Broadway. 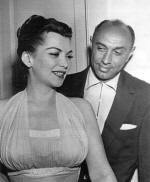 Julie is mentioned in Sid Caesar's autobiography, Where Have I Been? (Crown Publishers, written and copyrighted 1982.) A picture of him and Sid together is shown in the book, and is taken from a scene in "Make Mine Manhattan." He performed in that same play again with Phil Foster on the Subway Circuit in 1948. He is also mentioned in the book, The Borscht Belt by Joey Adams together with a picture of him. The book was published by Bobbs and Merrill Press. Julie Oshins was born in Brooklyn but grew up in the Bronx. Julie and his Brother Lou were star athletes at Morris High School in the Bronx. Julie was captain of the football and track teams at Morris High. He and his brother Lou Oshins, who went on to become the track and field coach of Brooklyn College, won many awards for track and field events. above: Sherry Britton with Julie Oshins. 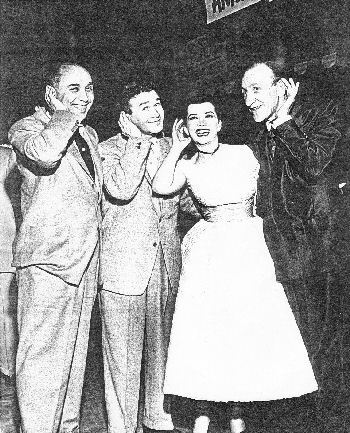 left: Julie with Joel Grey, Sherry Britton and Eddie of Leon and Eddie's. After graduation, Julie joined brother Lou as a physical instructor at the Morningside Hotel, a resort in the Catskills. In the summer at the Hotel, he directed and and played in the weekly comedies presented for the guests. A funmaker, a "live wire," a clown, a prankster, the life of the party. The paid social director and entertainer in those Catskill resorts that constitute the "Borscht Belt." 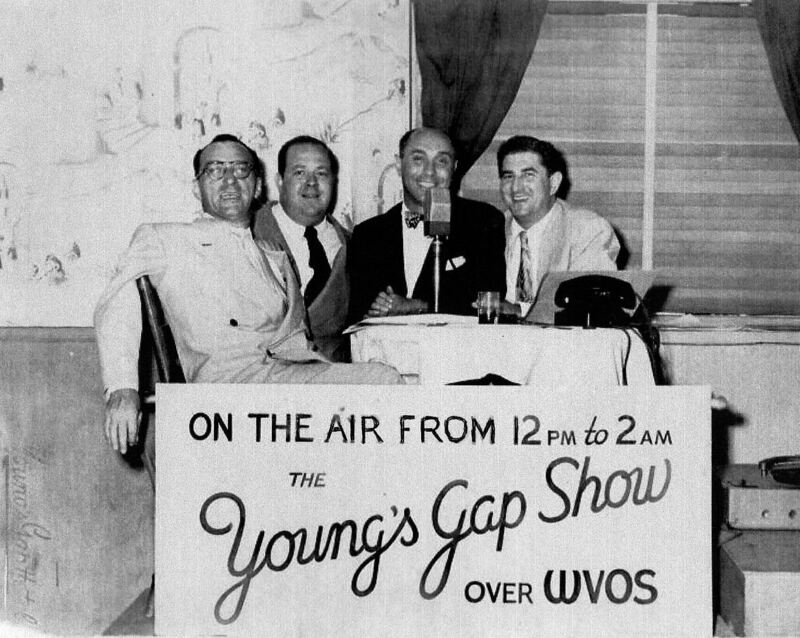 He was one of the star comics in these Catskill hotels, appearing with Henny Youngman, Red Buttons, Philly Foster, Harry Morton and Jan Murray. He worked in Young's Gap in Parksville, NY and the Hotel Olympic in So. Fallsburgh, NY. Actually from Morningside he went to the new Concord Hotel and there met Ben Lessey, a drummer. Together they wrote a series of satirical songs. "We used to imitate big stars and louse them up," he explained in an interview later, "also we were the originators of 'Russian Doubletalk.' Julie and Ben worked in night spots in the Times Square area until the end of Prohibition. He even played at Ciro's in London. He received his draft notice, was seen by Irving Berlin at Camp Upton emceeing shows, and was chosen for many parts in "This Is The Army". 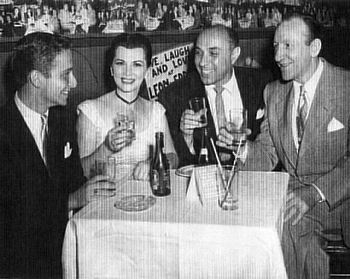 Julie was a nightclub and speakeasy entertainer with Slapsie Maxie Rosenbloom and Ben Lessey, and he appeared and performed on the radio. He took over the part of Nathan Detroit in "Guys and Dolls" when Sam Levene left. He also wrote comedy for the Sheldon Leonard and Danny Thomas TV shows. According to Cardiff Database he appeared in the 1951 movie "I'll See You In My Dreams," a biography of Songwriter Gus Kahn. It was a Warner Bros. film and starred Danny Thomas and Doris Day. Julie played a character named "Johnny." His best friend and fiancée was Sherry Britton, a famous Burlesque queen of that time and just mentioned recently in an article by Mitch Broder. Sherry was eighty in August of 1998. Julie Oshins died before his fiftieth birthday.